Here's a microphone described by Akustica as the first HD digital output mic, a tiny device destined to be designed into laptops and broadband mobile devices. The company says this AKU2103 mic is the first to "guarantee compliance with the TIA-920 audio performance requirement for wideband transmission in applications such as Voice over Internet Protocol (VoIP)." It's also immune to radio frequency (RF) and electromagnetic (EM) interference, letting laptop or cellphone designers locate it just about anywhere on the device, even if it's near a Wi-Fi antenna or LCD screen. But what exactly is meant by "HD audio wideband," anyway? Don't get too excited yet, because we just noticed that the TIA-920 definition of "HD audio wideband" is a frequency response between 150Hz to 6800Hz. Jeez, that's not exactly high-fidelity. And how bad does that make microphones that don't adhere to this guaranteed standard? It's a real breakthrough, though. 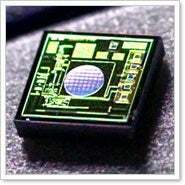 It's a CMOS microphone, a tiny integrated circuit, that outputs a digital audio signal. Cool. Don't expect to see this little button-size microphone in recording studios anytime soon, but it might make a significant difference inside of a laptop or cellphone.